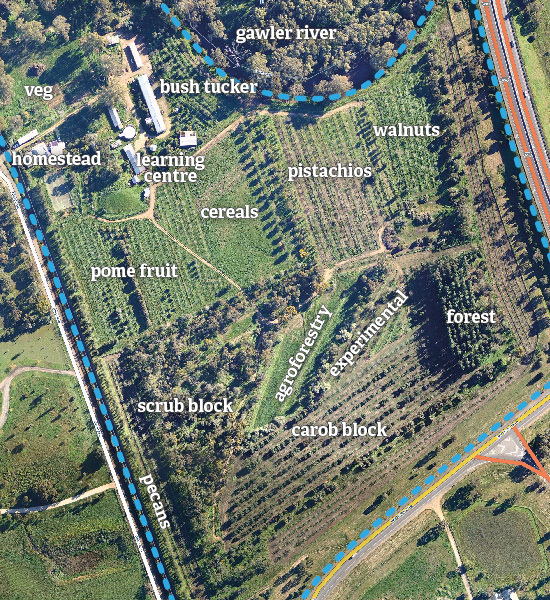 Developed by Annemarie and Graham Brookman, and their children Tom and Nikki, the Food Forest is a permaculture farm and learning centre located in Gawler, South Australia. They purchased their 15-hectare property 25 years ago when it was little more than a bare patch of land with scarce rainfall. With time and a good design, they have turned it into a viable permaculture farm that feeds both their family and the wider community. Today, there are over 160 varieties of organically certified fruit and nuts, wheat and vegetables, free range eggs, honey, carob beans, Australian native foods, nursery plants and timber. It is recognised as one of Australia’s best and most sustainable organic small businesses, and has grown steadily for over 20 years, maintaining low debt and high equity levels. On the property, rainwater is collected for use in the house, solar panels heat the water, and photovoltaic cells provide the house with electricity, and surplus power is fed onto the grid. Water in the house is solar heated. Their income is diverse and is consistent with the values they promote. One important part of it is having NASSA organic certification. They grow high-value perennials: nut crops – pistachios, walnuts, etc. They are recognised as Australia’s largest grower of organically certified pistachio nuts and carobs. Through a fortnightly farmers’ market stall they sell fruit, vegetables and seedlings. They value-add: they grow grapes and produce wine, they grow olives and produce olive oil and a diverse range of other products. They are a shining example of a successful and sustainable permaculture enterprise. Education is also a large part of the equation; they teach PDCs and once per year with David Holmgren as a teacher. In addition, they have a self-published DVD – Design for Life: the Food Forest Story about their journey towards establishing The Food Forest. • Sale of produce and products – 50% – organically certified fruit and nuts, wheat and vegetables, free range eggs, honey, carob beans, Australian native foods, nursery plants and timber. Value added – wine, olive oil, cider…..